The Sanya Boundary Island (Fenjiezhou Island) recently introduced an all-submersible tourist submarine to enrich its underwater tourism projects. It’s said that there are only 8 all-submersible tourist submarines in the world, and the one used in the Sanya Boundary Island is set to be the only all-submersible tourist submarine in China. At present, the Sanya Boundary Island has underwater tourism projects such as semi-submersible tourist submarine, offshore diving, dolphin diving, cave diving, and sea walking. 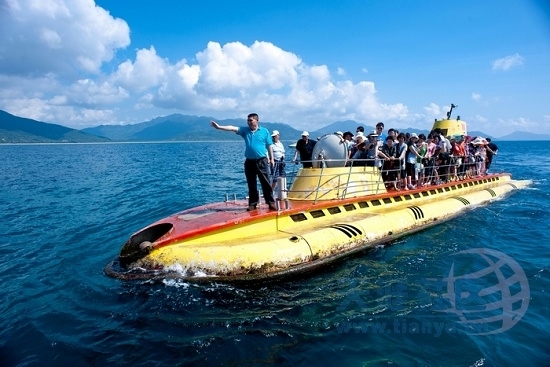 The all-submersible tourist submarine is now on trial run at the Sanya Boundary Island; tourists can enjoy the privilege to experience the tour under water. The submarine has a length of 18.6 meters and a weight of 106 tons, and can contain 46 tourists. Equipped with an air purification and oxygen cyclic system and central air-conditioner in the passenger cabin, and television pickup system in the cabin, the operator is able to observe the neighboring seascape on the deck. Tourists can visit the underwater world easily without any devices, and all kinds of corals, tropical fishes, sea urchins, starfishes, shells and shipwrecks will be viewed through the bright and huge viewing windows.